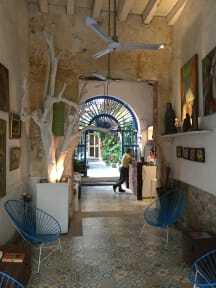 Be Lounge Hostel is located in the Heart of the Walled City of Cartagena, set in a 400-year-colonial house. This property is a house with two floors, the first one with a local restaurant and a garden bar and the second floor where the rooms are located is surround by a colonial balcony. There is also a terrace where people can meet and take a sun tan or see the stars at night.The look of the house is made with a vintage decoration with lots of cool old details that makes us uniques. We want you to experience the idyllic atmosphere that Cartagena give In Be Lounge, we want you to write and live your own history. Be lounge is Located in the center of Cartagena on Calle de la Mantilla, a few meters from Plaza de Santo Domingo, 2 blocks from the walls and café del mar. This property offers free WiFi and a sun terrace Also, guests can enjoy the on-site bar. Some units feature a seating area to relax in after a busy day. A terrace or balcony are featured in certain rooms. Rooms have a shared bathroom fitted with a shower. I've always stayed in this place for its location: its close to everything and at the same time far away from all the noise that could possibly interrupt my sleep. Staff is amazing. Only thing I would improve is breakfast, but then again for the price is actually not so bad. We stayed in B lounge for four nights and the staff were extremely helpful with all the places we wanted to visit. They were able to give some good recommendations For other local places to go visit, that we did not know about. The hostel itself was really clean and the overall design was quirky. If i was in Cartagena again I would definatly stay here again. We really enjoyed our stay at Be Lounge. The staff were super friendly and very helpful. The rooms were nice and clean and the location is perfect! We will definitely stay here again next time we are in Cartagena! Good rooms, excellent location. Breakfast was nothing special, but it's convenient cause they have a small kitchen space and a fridge for you to use! The staff was super helpful with suggestions. 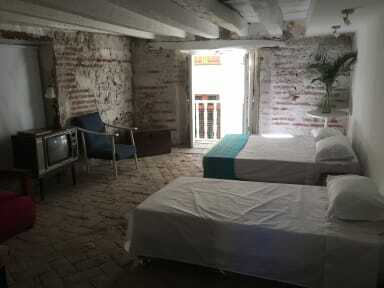 This hostel is located right in the heart of the historical Old Town, making the location unbeatable. The building and decor is gorgeous and aesthetically pleasing. I stayed in the 5 bed mixed dorm and ended up getting a bedroom to myself, due to how the 5 bed dorm is set up with a staircase leading to a small upstairs area. The breakfast was so-so and there are only 3 bathrooms that could be cleaned more often, but it was my favorite hostel I’ve ever been in. I can’t wait to return. Very good clean and comfortable hostel. Perhaps lacked in the social aspect and breakfast could have been better. It is well located for Centro, however Getsemani hostels are better located and cheaper. However, Andreas was particularly helpful in the search for some things I lost even after I returned a day after checking out. I was so happy with the look of the place but ultimately I had to check out early because if the humidity and smell in the dorm. I got sick from the extreme ac at night and the moisture in the rooms. I realize that moisture is inevitable when staying in an old building but I wouldn’t recommend the place to anyone I know. Gorgeous interior and good location, and Andres on reception was a real saviour to be honest. If it wasn’t for him we wouldn’t have anything special to say about this place. No towels, poor breakfast, no hand soap. The entire place is pretty open plan and so every little sound is heard throughout the hostel. Cleaners and fellow hostel guests were so noisy and inconsiderate. We had the ‘private’ room way upstairs but it had no doors so couldn’t shut ourselves off. Plus no windows that opened. Great location and really helpful staff, but... there are only 3 toilet / showers between all the dorms (30 ish ppl) so there were queues. The aircon was on max, so we froze every night. Breakfast was very basic - toast, coffee and juice.